One of these pieces was carved with water lilies for the family room in Greene and Greene's Blacker House. Nickel plated handles by Audel Davis. A pewter bowl by Archibald Knox inspired this table. This “throne” was designed for the mistress of the Blacker House. The carvings for the Blacker House family room furniture are all exclusive to the house. 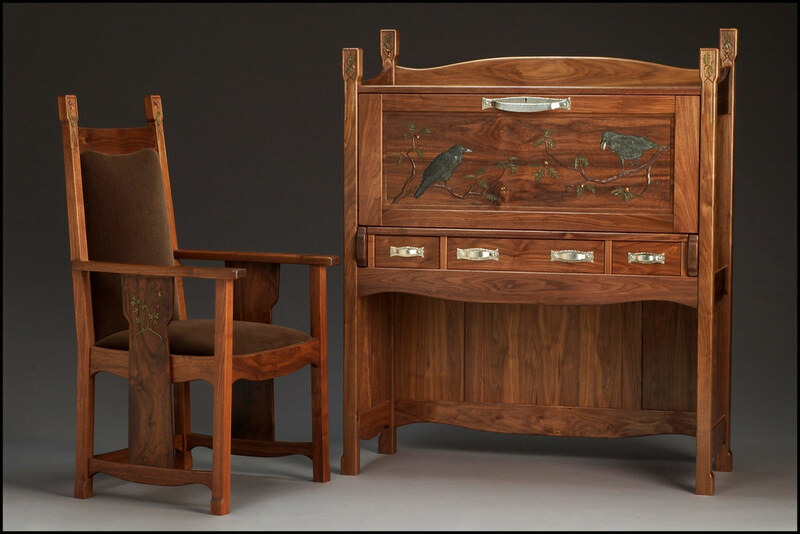 Voysey's finials influenced these pieces. The drop front of ravens and california oaks hide interior cubbyholes. An anniversary present commissioned by husband and wife. Three drawer writing table with bent back side chair.